I would like to whiten my teeth? There is often confusion amongst the public and patients regarding tooth whitening, below is a 'guide to safe and appropriate tooth whitening for patients'. Tooth whitening is an effective and efficient way to lighten the appearance of natural teeth without removing the any tooth surface, such as the enamel. Dentists prescribe tooth whitening gels that contain either hydrogen peroxide or carbamide peroxide. These substances break down into oxygen and water. 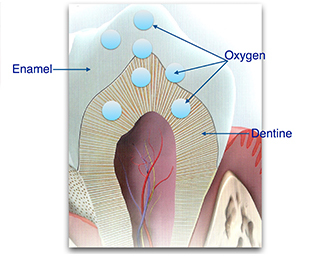 The oxygen travels through the enamel (outer layer of the tooth) into the dentine (middle layer of the tooth) where the oxygen cleanses out the impurities that cause the tooth to appear discoloured, this cleansing action creates a 'lighter' appearance. Before tooth whitening treatment is carried out ? The dentist should carry out a full examination of your mouth, checking your teeth for any signs of decay, broken teeth or fillings. The health of your gums should be assessed, dental radiographs (x-rays) maybe necessary to detect decay or abscesses. The soft tissues such as tongue cheeks, lips and palate should also be examined to ensure they are healthy. Once the examination is complete the dentist should record the shade of teeth and then discuss the most appropriate treatment that will achieve the desired result. A plan outlining the recommended treatment should be presented, including the fees. You should also be given the opportunity to ask questions relating to the planned treatment. There are 2 types of tooth whitening treatment available, home whitening and in-surgery 'power' whitening. This type of treatment, is a carried out by the patient at home, following specific instructions from the dentist, dental hygienist or dental therapist. The treatment involves having dental impressions (moulds) taken, a special mouth guard is made specifically for the patient. Hydrogen peroxide or Carbamide peroxide gel is applied to the tray, with the patient wearing the tray for a specific length of time. Hydrogen peroxide is used during the day for between 30-45minutes. Carbamide peroxide, is usually used for between 2-4 hours during the day or overnight. The treatment can take between 2-6 weeks depending on the colour of the teeth at the beginning of the treatment. Some colour staining of the teeth may take longer than 6 weeks. Home whitening is a good treatment option for the most patients, especially patients with darker stains on the enamel. As the name suggests, this treatment is carried out by a dentist, dental hygienist or dental therapist in the dental surgery. This treatment, requires a long appointment anything up to 2.5hours. A special plastic resin is applied to the gums and hydrogen peroxide gel is applied to the tooth surface. The gel is left in contact with the tooth for approx. 15minutes, then removed and re-applied. This cycle continues 4 times. 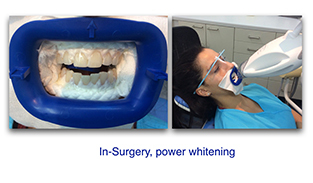 'Power' whitening involves the use of a light to enhance the process. 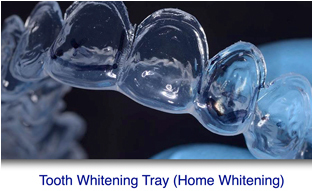 On completion of the treatment, the patient is should continue with the home whitening trays at home for a specified period of time to ensure the desired result is achieved. The treatment may be used as a 'top up' procedure or suitable for a patient with a naturally lighter shade of teeth. If the treatment is carried out correctly the colour of the teeth once the treatment is complete, should remain the same for at least 18 - 24 months. Topping up should be carried out under the guidance of a dentist using the same type of gel used during the initial treatment . The research shows that tooth whitening is safe. A suitably trained dental professional such as a dentist, dental hygienist or dental therapist can discuss and provide safe and appropriate options for treatment based on their knowledge of the patient's oral health and their individual therapeutic needs. Sensitivity during treatment affects at least 50% of patients. The sensitivity can be anything from a mild awareness of your teeth to shooting pains. Using various de-sensitizing products as recommended by a dental professional sensitivity can be successfully managed so that treatment can be completed. There are many whitening toothpastes available, on the whole whilst they do not change the colour of natural teeth, they can help to remove surface stains on the teeth, such as tea, coffee, red wine etc. Home whitening kits available over the counter are usually less expensive than professional tooth whitening at a dental practice, however not always assessed for safety, increasing the risk of damage to the gums and teeth. The acidic nature of these gels can also be harmful. In the UK and Europe, tooth whitening products sold over the counter must contain or release up to 0.1% hydrogen peroxide, this strength has little impact on whitening teeth. Fees for professional tooth whitening by a dental professional vary from practice to practice and also depending on the area of the country. In-surgery/Power Whitening is often more expensive than home whitening treatments. The dental practice, should be able to provide patients with a written treatment plan detailing treatment recommendations and the fees involved before the treatment commences. Crowns, bridges, dentures. The hydrogen or carbamide peroxide is only effective on natural teeth. Tooth whitening is a treatment that is described in the Act of Dentistry (1982) which means that only dental professionals such a qualified dentists, dental hygienists and dental therapists can provide tooth whitening treatments if they have under taken training. 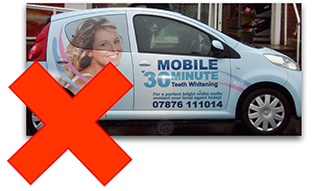 Therefore, non-dental professionals, such as beauticians are advised not to carry out tooth whitening treatments. In the UK, legislation that came into effect in October 2012, does not permit the sale of tooth whitening products which contain or release more than 0.1% hydrogen peroxide to anyone else other than a dental practitioner. This legislation was put in place primarily for the safety of patients..
To maintain a 'whiter or lighter' appearance, patients are advised to reduce food and drinks which can cause staining. Smoking can not only cause tooth surface stain, but over time causes staining within the tooth structure. Another reason to stop smoking.